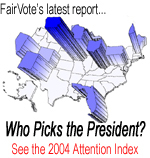 FairVote - Who Picks the President? Home. > Presidential Elections Reform > Resources > Electoral College > How the Electoral College works today > Report: Presidential Elections Inequality > Who Picks the President? FairVote's Who Picks the President report tracks television spending and campaign visits by major candidates during the height of the 2004 presidential election. The report seeks to ascertain just how wide the gulf between swing and non-swing states has become in a modern election, and the conclusion--vast-- is hardly reassuring for supporters of American Democracy. More money was spent on television advertising in Florida during the period covered than in 45 states and the District of Columbia combined. More than half of all campaign resources were dedicated to just three states-- Florida, Ohio and Pennsylvania. Iowans are the most coveted voters in the country. 18 states saw neither a candidate visit nor recieved a cent of spending on TV advertisements.